Recently I had the chance to spend some time at the Jersey shore. Not Snooki’s version of the “Jersey Shore;” an active adult community version of the Jersey shore. My parents, Falafel and Hummus, retired there and invited me to visit for a mini-vacation. We haven’t shared a roof in 17 years, but I do remember some of their more traumatic household quirks: grinding coffee at ungodly hours of the morning and eating the stinky cheese that was a perpetual resident in our refrigerator. What I don’t remember from my time living at home was how finicky they are about their garbage. While getting ready for bed on the first night of my visit, I discovered that there wasn’t a trash can in the guest bedroom or bathroom. Rather than disturb my parents, I just walked to the nearest available receptacle in the kitchen and disposed of my items. That should have been my first clue about their highly structured rules and regulations for the disposal of garbage. I started to snicker and couldn’t stop myself. “So, you put all of your garbage in the freezer?” I needed clarification. “What exactly qualifies as stinky garbage? Do you have a specific list?” I was curious. I understood the theory of the freezer garbage, but this was too much fun to just let slide without further investigation. “You’re making fun of me, but the wrappers from chicken and fish stink to high heaven when we put them in the garbage can in the garage during the summer. Laugh all you want, “said Hummus. “Don’t worry. I will,” I said as I rolled my chair back into the office and giggled. 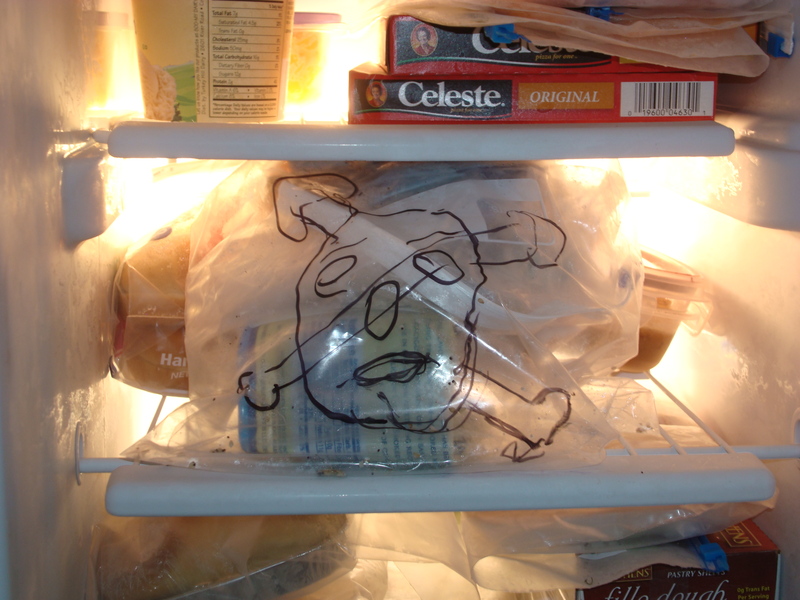 Photo of freezer garbage courtesy of Falafel who added the skull and crossbones for dramatic effect. “You’re not going to write about this are you?” I heard her question nervously from the other room. I wasn’t sure if they were worried about starting a freezer garbage trend or if people would think they are crazy. “I’m not going to write about this. No one wants to read about your garbage. Your secret is safe.” I truly believed that until the next morning. “We do, but you can’t put banana peels in it,” said Falafel. Ben Franklin once said, “Fish and visitors stink after three days,” and that was before the days of modern refrigeration. I was afraid that if I didn’t leave by the third day, I’d wind up in the freezer with the rest of the stinky garbage. At the door, my parents handed me a care package. There were zinnias and leftover dessert each in their own plastic Ziploc bags. When I arrived home I transplanted the zinnias in my garden and shared the dessert with Oregano. I was about to drop the Ziploc bags into our unrefrigerated garbage can when I had an idea that would show Falafel and Hummus my appreciation for their hospitality and an understanding of their garbage rules. I put the bags through a rigorous two-step sanitization process (rinsing and drying) then folded them up neatly, placed them in an envelope and mailed the bags back to them. I’d like to thank Grace from Czech the Flip for offering the Very Inspiring Blog Award to me. Grace is an adventurous woman from the Philippines who moved to the United States where she met and married her husband. Now they have a son and live in her husband’s home country, the Czech Republic. Grace blogs in English about her adventures adjusting to her new life. Now that’s what I call inspiring. Go “czech” out her blog. Posted in Uncategorized and tagged family, garbage, garbage night, humor, life, recycling. Bookmark the permalink. I have to say this is so funny. Just yesterday I recall thinking to myself that I should put my leftover raw ground beef in a baggie and put it back in the fridge because our garbage disposal isn’t working right now (I apparently brought it to its demise in the early part of the day) and trash day is 6 days away. I thought about it for a few seconds, and then decided to put it in a baggie before putting it in the kitchen trash can… Funny stuff. People are funny. I’m so glad you enjoyed the post. When I saw my parents put their garbage in the freezer I thought they were unique. As it turns out, a lot of people have used that same trick. Who knew? Thanks so much for taking the time to read, comment and subscribe. Hope to see you again soon. That’s exactly what I told them. It sure feels good not to have enough to do rather then not having enough time to do the things we like to do. You are absolutely right. Without quirky people in my life, I’d have nothing to write about. This post has taught me that putting garbage in one’s freezer is not unique. It’s just not something that most people are willing to talk about. I’d like to think that this post has shed some light on the subject so that all you freezer garbage people feel like you have a support network. As for my sense of humor, I firmly believe that is a genetic trait inherited from my dad. i have been busy doing non-blogging things, as you may have realized, but i really have not forgotten you. i especially have not forgotten this post. although it is September, the weather has been quite warm here – which is a good thing actually, since we currently don’t have a working heating system, as you probably know from a post over at p&k. I’ve missed your fun comments, but know you’ve had your hands full lately with things in the non-virtual world. Thanks for taking the time to share your freezer garbage experience with me. I’m going to forward the link to my parents. I’m sure my dad will be thrilled and take every opportunity to remind me what a good idea he had. I LOVE that you took a picture of it! i actually have some sad news. the photo website where my frozen fish trash is currently posted, is shutting down – very unexpectedly, quite soon, and permanently. After November 1, the link above will no longer be active. but am glad that you had a chance to see the photo while it was available. just wanted you to know. if you would care to have a copy of the original photo, i could email it to you for reference. if you don’t need it, then no worries. That was so very sweet of you to give me a heads up about the frozen fish trash photo. I don’t foresee needing a copy, but I appreciate you thinking of me. Good luck saving all of those beautiful pictures and related stories. I would hate to think they have been lost somewhere in cyberspace forever. I came to your blog because the Spice of Life container is a blast from my past—my mom believed that one could keep spices for upwards of forty years. Then, halfway through your hilarious post, I realized that your pet names for your parents are two substances that reliably make me violently ill! What a fun coincidence! Don’t even get me started on garbage. . . Your mom is right. One can definitely keep spices for 40 years, whether one should eat them after that long is questionable. I bought my Spice of Life tin at an antique store and it is still filled with paprika. I have no urge to taste test the contents. How funny. Love the skull and crossbones. They were a nice touch. I almost fell out of my chair when opened the email with that picure in it. I agree with you about wanting a separate freezer just for garbage. I don’t have enough room in my freezer to give my garbage sufficient distance from my frozen food. And I thought that my mother collecting weird looking clowns in her dotage was odd. Now I learn it might have been much worse! At least my parents are throwing out their collection once a week. I’m guessing your mom’s clowns are more permanent residents. Sadly, my Mom’s gone. Much more happily, the clowns are too. They were really weird. Sorry to hear that your mom has passed. I hope you have many happy, clown-free memorie of her. Yes. The clowns moved in after I moved out! You should add a special addition of your blog entitled “Secrets of a Senior Household,” by Falafel and Hummus. I can’t wait to hear how they handle clothes washing at their home. That’s an excellent idea, Ronnie. They did do some laundry while I was visiting and I’m sad to say that it was completely mundane. Maybe I should interview them for the new feature you are talking about. Better yet, I could sneak back for a visit and observed them in their natural habitat. Did you enjoy the Jersey shore? I hope it was one of the nicer sides of the place, coming from someone who actually lives there, I have never been anywhere that is portrayed the way that New Jersey is on T.V. I had the opportunity to visit Spring Lake and Ocean Grove while I was staying with my parents. Both were beautiful towns. I’ve lived in NJ my whole life and hadn’t been to either of those towns. There is something about seeing those colorful Victorian houses right on the beach that makes me feel like I’ve stepped back in time. That image couldn’t be farther from the one that is portrayed on the TV show. So the scary thing is I didn’t laugh out loud like I do at most of your posts……because I thought it was a great idea! I use zip loc bags to dispose of cat food cans and things like banana peels, apple cores because I don’t like them sitting in the kitchen garbage naked and smelly! The freezer…..interesting concept! Kudos to them! OH MY: Falafel and Hummus, I love you! I am guilty of some of the above garbage protocols! When I lived in NYC, I had far too many run-ins with roaches, so I took the “stinky” trash out every day and often put it in the fridge until then (very well contained). In fact, I kept EVERYTHING in the fridge – dry cereal, nuts, sugar. To this day, I save supermarket bags and yes, I put things like banana peels in them 🙂 So it’s not just a practice of retirees! This post has certainly been enlightening into the world of other people’s garbage disposal techniques. I had no idea so many people had so many different strategies for garbage. No one ever talks about it during polite dinner conversation. If this experience has taught Falafel and Hummus anything, it is that they are not alone with their freezer garbage concept. I seem to recall that in “Back to the Future,” garbage was the fuel of the futuristic car….maybe your parents should get a bigger freezer and start saving up to put Exxon out of business. Wow! Good memory, Bob. The fuel for the car in Back to the Future was garbage. I’ll have to pass your suggestion along to my parents. Maybe they can fund their retirement with garbage. Gee whatever happened that they’re suddenly using actual food instead?? I think they used banana peels and other peels etc for the fuel in Back to the Future. Who is using actual food for fuel? Thanks so much for taking the time to explain this so thoroughly. I had no idea they were using corn that should have been used for human or animal consumption. I know so little about this. Thanks for sharing the information. Too funny! Glad you didn’t wind up in the freezer. Best to stick with garbage bags, not body bags. Excellent point, Lisa! I don’t think they had a Ziploc bag big enough to put me in. Good thing I got out of there in time. Do you ever wonder what they do with the grass clippings? Don’t ask! Thankfully, they no longer cut their own grass. Your parents are hilarious. Sounds like it was a lovely homecoming! My parents are funny and provide me with lots of material for the blog. It was a very fun mini vacation for me. BTW here we have six, yes six, garbage bins!! You need a degree in applied mathematics to work out what goes in what and then one of those crime scene cover-all body suits to deal with the fallout just in case anything could be deemed a biohazard! I didn’t tell Falafel and Hummus about the package in the mail, but the minute Hummus opened the mailbox and saw the large envelope she knew something was up. When she opened it, slid her hand in and felt the plastic bags she started laughing hysterically. My ex-inlaws…lol, that sounds very funny to say, anyway…they would unwrap food that had been kept in aluminum foil or plastic wrap and wipe it clean, dry it, fold it up and keep it to use again. They did the same with ziploc bags. I never understood the point, thought that was what tupperware was made for, use it, wash it…use it again! I must admit that I do put my stinky garbage into ziploc bags before dropping it into the trash can though…we don’t have trash pick up at all and have to drive it ourselves! Afraid the germaphobe in me would never let me re-use things and I doubt I’d eat out of the freezer that stored trash, haha…very fun article! I can’t imagine wash and re-using plastic wrap or tin foil. You’ve got to have a lot of time on your hands to try to wash plastic wrap. I have all I can do to get it off the roll the first time, let alone flattening it out, washing it and drying it. Not having trash pick up must be a pain in the neck. Thank you for making me grateful for my trash pick-up. Very funny post! I know Hummus and Falafel were laughing the whole time. Keeping the smelly garbage in the freezer is good idea, though. I’ve saved expired food in the frig until garbage day. Why smell it if you don’t have to? Another funny post! I think that the way Falafel and Hummus (I love their names!) handle stinky trash is pretty interesting and makes a lot of sense. You don’t want to live with that smell for a week. If only I have extra freezer space, I would do the same. I know. Do I sound weird too? Unfortunately, as with everything else in Europe, we have a small fridge with a tiny freezer. So stinky trash ends up in the common bin. Now I know where your sense of humor comes from. I look forward to reading more about Falafel and Hummus. Lastly, thanks for the blog plug. I know I teased Falafel and Hummus about the freezer garbage, but it was a clever way to deal with the problem. It was just so funny to hear them say they were putting the garbage in the freezer. I wasn’t expecting to hear those words together. So, I don’t think you are weird for thinking it is a good idea. It would have been impossible not to develop a sense of humor growing up in my family. Thanks again for the award. I was happy to plug your blog. Hope you get some new readers. Now I am definitely scared. Your blog made me laugh, but I actually think your parents have a good idea. I guess I have already morphed into a retired person thinks about doing very strange things. and already I can’t write – add the word “who” after person and before thinks in my reply. It’s obvious where you got your sense of humor from, Paprika. We have some rituals involving garbage, but they aren’t as refined as your parents are. On the plus side, we have garbage pick up twice a week … and recycling on a third day. In Florida, the frequent pick ups are vital – given the heat. I definitely got my dad’s nose, his toes and his sense of humor and for that I am grateful; well, maybe not so much for the toes. Our garbage rituals at home seem so simplistic compared to other people’s. I know how badly my garage can smell in the summer, but thankfully, we have garbage pick up twice a week in my town. Thank you to you and Falafel for providing the material for this week’s blog post. You are very good sports. Love you both. Ha! My parents totally do this too and, I can see why as my garage stinks to high heaven during the hottest summer in 75 years. I love the Hummus and Falafel blog names. I absolutely see the merits of freezer garbage, but it was just so funny to hear her remind my dad to put the garbage in the freezer. This reminds me of my wonderful but crazy former in-laws. I stayed there a couple days many years ago and the rules were incredible and funny. You couldn’t use the microwave because that was the bread storage box. The cakes were in the oven all the time. The breakfast table was set before they went to bed. There were others but I don’t remember how the garbage was handled. I’m curious. Do your parents read your blog? Will you ever get invited again? My parents like to cook so I don’t think they’ll be using the microwave and oven for storage, but I’ll keep an eye out for that. Your ex in-laws sound like a riot. My parents do not have a cat. Even if they did, I’m certain that stinky garbage for the freezer is only food based stinky garbage. My own mother is getting a bit strange about her garbage. She also saves her quart yogurt containers for various and odd uses. I laughed out loud reading this, Paprika. The sad thing is, I feel myself slipping more towards the “peculiar” every day! So glad to know I made you laugh out loud, Melanie 🙂 Thankfully, they haven’t started collecting used plastic containers, but I’ll keep my eyes open next time I visit. I think we all have some peculiar habits. The trick is finding someone to live with who has the same peculiar habits so that they don’t seem all that peculiar until you have a houseguest. Oh that’s funny, Paprika! I’m very much like your parents (banana peels go to my yard, though). When guests get confused about the “rules” of trash, I just say, “Drop it in the sink and one of us will care of it.” Then I let my kids do the proper rinse/sort. I do agree with Ben Franklin’s assessment about fish and visitors. Even with refrigeration. That’s great that you are able to compost or recycle so much of your garbage. Recycling and having a garbage disposal helps keep down the amount of garbage we generate. Oregano is very strict about recycling everything it is possible to recycle: electronics, paper, plastic etc. As for Mr. Franklin’s quote, 3 days seems to be the sweet spot for visitors. It’s enough time to have a nice visit before everyone gets on each other’s nerves. Thanks, Nancy. I definitely see the practical merits of freezer garbage, but it caught me off guard and they were so serious about it. Your parents are hilarious! The picture on the bag is great. I have friends who put egg shells in a paper towel and then plastic baggie before throwing in the trash can. They might have your parents beat. At least your parents’ methods keep the house smelling good. I don’t think egg shells could stink if they tried. My dad surprised me with the picture on the bag. I forgot to sneak a photo of the freezer garbage before I left. When I got home, I asked him to take a picture and email it to me. I just about fell out of my chair laughing when I opened the attachment and saw the skull and crossbones.